Product #16680 | SKU 116011 | 0.0 (no ratings yet) Thanks for your rating! 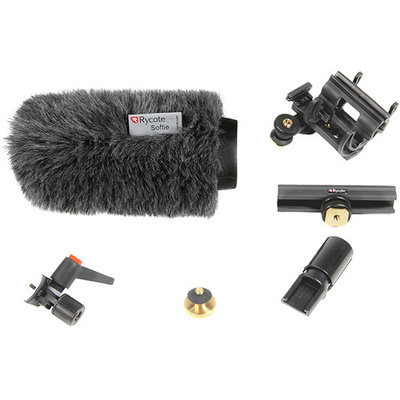 The Rycote Classic-Softie Camera Kit for Shotgun Microphones (15cm) is an all-in-one kit for outside filming using your camera mounted shotgun microphone with a slot no further than 15cm from the front of the mic and 19-25mm in diameter. This kit contains a microphone shock mount with attachments suitable for mounting video cameras, booms, and stands. It also contains a Classic-Softie windshield for protection against wind noise. The kit also includes an InVision Video Shock Mount that incorporates a patented Lyre suspension to provide enhanced protection against vibration as well as handling and camera motor noise. This flexible shock-mount is fitted with a Hot Shoe fixture, but also comes with a Male to Female thread adaptor, 3/8" Boom Swivel and Camera Clamp Adaptor, for versatility in how you attach this mount to your camera or boom pole.